שש-בש – game rules. 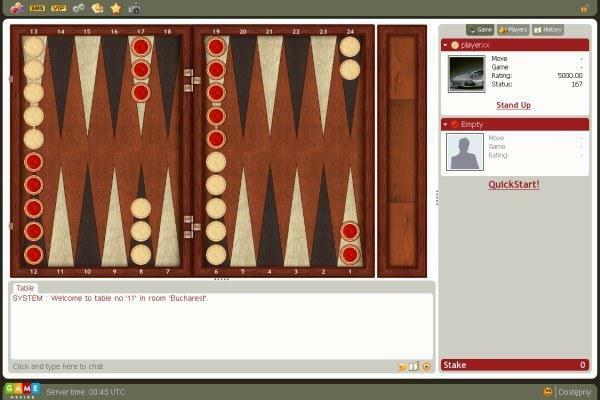 אפשרויות – see how to play שש-בש on GameDesire! Bring your pieces home to best your opponent! The Center is reserved for Tables, bottom for Chat and right column is for Room informations. 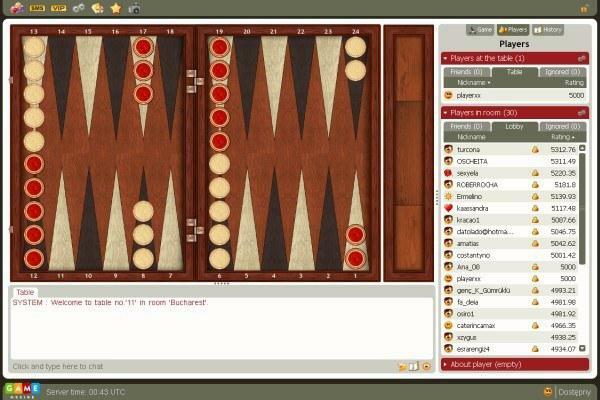 The simplest way is choosing Join button and entering existing table, created by another player. This option allows to enter the table and start the game if opponent is willing to play. Second option is Create Table button, visible above tables list. It allows you to create your own table with chosen parameters. Number of possible tables for one player is defined by room administrator. After entering a Table ask the Opponent to start the game. Simply click on Start Game button or ask your Opponent to do so. Game / Move Time Time limit set for whole Game or/and one Move Games without time limits are easier. Game with time limits are faster and harder. „Table Filter” allows you to only see those tables that interest you and hides all other tables from view. If you once again want to see all tables, set the first four menus to Not Important and uncheck the three checkboxes at the bottom. „Table View” button allows you to change view of all tables in room. You can view table list using predefined views: Big Icons, Small Icons, No Icons, No Settings, Super Small, List. Try them out and pick the best one for you. When creating your table, remember about two important things. First of all, some of settings may be forced by Room options and you won't be able to change them (described options will be faded out then). Secondly, choose your Table settings wisely, because You won't be able to change them in another way than by creating it again from the beginning. Money & GameChips Options for advanced users. Here you will find settings for playing with real money or virtual GameChips. This kind of tables will usually be created by system or administrator in public rooms. Game Rules Additional game rules. Identification & Access Pick name for your table and invitation for everyone entering. Now define do you want create table for automatically running games with random or entering players (QuickStart!) or completely closed for public invitation-only (Private table). 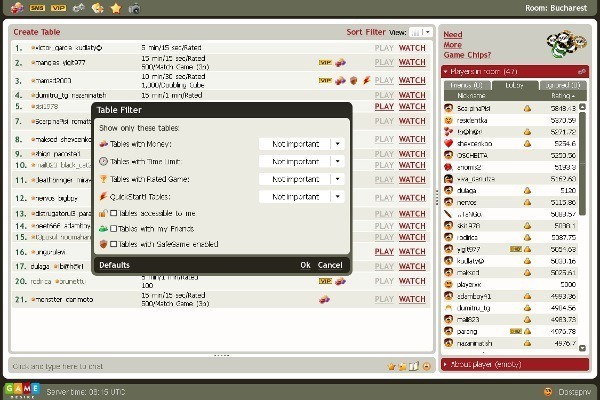 At the end, allow or not watchers and guests to enter or access chat. Security Decide if you want to give your opponent possibility to return to game after disconnection. When he will be offline, time will freeze. Maximum allowed disconnections is set to three. Game/Move Time Set time limit for every move or whole game on created table. This controls game speed (shorter time limits equals faster game play). Rating Table with games whose result will affect the Rating of the players. Every player has a Rating which is based on the number of games played, number of games won vs. games lost, number of games abandoned, etc. „Players in room” list shows you all players present in particular room. Below you have three tabs: Lobby, main one, showing all players, Friends and Ignored lists, set by You. By using icon (next to Rating), you can set detailed players information you want to see on your list. Private / Close Chat Opens or closes tab for private conversations with user. Add / Remove from Friends List “Friends” tab is a list of your favorite players, which makes it easier to find the people that you are friends with. Add / Remove from Ignored List “Ignored” tab is a list of players from which you don't want to receive any messages. That player will not be able to start a private chat with you or invite you to play a game, also you won't see what ignored player writes on the main lobby. Player Profile Opens small window with Player Profile informations. Full Profile - WWW Opens browser with detailed Player Profile on Website. This list may vary, depending on your status. For example, if you're an administrator, you will find here administrative options. At the top-right side of game window you will find three buttons - Options, described below, Help, linked to help section of site and Find, for finding detailed players profiles . Below is the name of the room you are at the moment. You can change room, using next button “Change room”. Options button allows you to set some important personal game options. Invitations Decide if you want to be invited by other players to play game with them. Then set options, if you reject to play with ignored players, all players or guests. Chat filters Decide if you want to receive private messages from ignored players or all players. Chat location Display chat from friends and system messages in different color or separate tab. Font size Change size of font used in all game windows. Changes will take effect after restarting application. In Chat window you can see what other players wites to main Lobby of the particular room. In form of tabs, You will also find here all private messages from other players send to You. Using many sets of icons you can build here your own emoticon, which will be visible in chat. Set most frequently used defines to improve your chat and response quickier. Raport abuses on chat directly to admins.